It appears not to have been Charles Perrault (1628-1703) who originally created this figure, later copied by the Grimm Brothers too, but that is no doubt quite a banal question for what we want to talk about here today. Nevertheless, everybody knows the story: the princess, the spell which put her to sleep, the years and years which passed by and finally, the prince who woke her up with a kiss. Sleeping Beauties is also said of those scientific articles which seem to go by unacknowledged until someone comes to their late rescue and gives them the recognition they deserve. 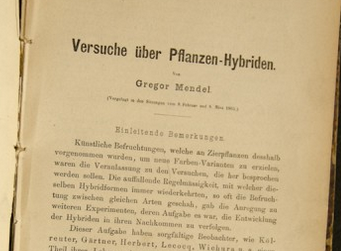 The article by Mendel of how the characteristics of the pea plant are passed down to its offspring can serve as an example. Even though the article was published in a scientific journal, in Germany I think it was, no one took any notice of it until years later when three researchers all at the same time gave him great credit for his work. 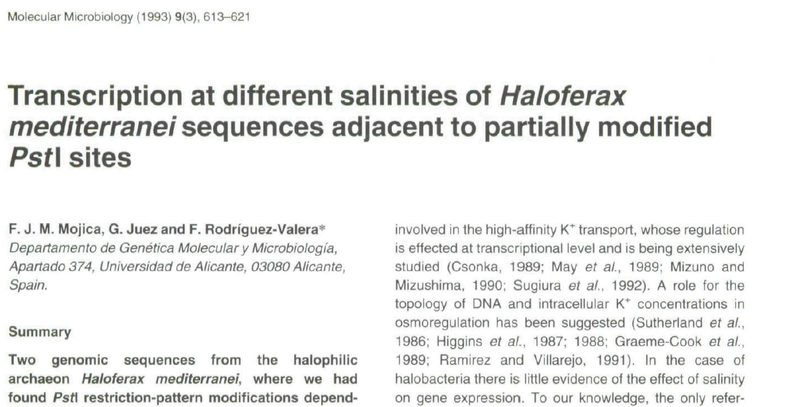 Recently, the press (El Periódico, El Mundo, eldiario.es, La Vanguardia) wrote about another case, that of the researcher from Alicante, Francis Mojica, who discovered repeated genetic sequences in the DNA of some microbes from a lagoon in Santa Pola 25 years ago. 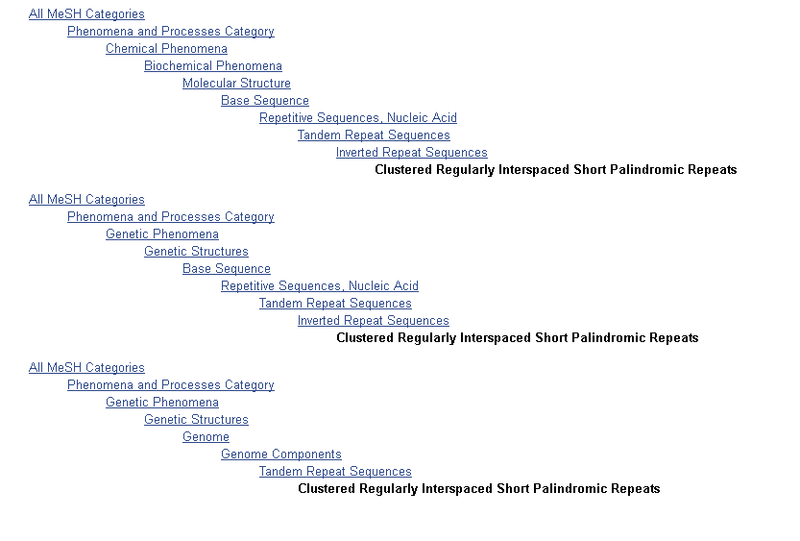 The researcher called them CRISPR the acronym for “clustered regularly interspaced short palindromic repeats”. From that point on, other researchers have been able to derive the CRISPR/cas9 genetic editing technique which, they say, will transform biology and biomedicine. This concept later got its own MeSH in the Pubmed/MEDLINE in 2014. A late recognition after a period of, let’s call it somnolence, is not that strange in the world of science and a way of demonstrating this is by looking at the number of citations an article receives. Needless to say this is made very apparent in a graph. During their sleep, the Sleeping Beauties receive on average few citations, but once awoken, they receive a large number of citations in the following 4 years: an exciting awakening. We find Sleeping Beauties in all fields of science, although in a systematic study of these, it is in the fields of physics, chemistry and mathematics that they predominate. One of the facts that explain the awakening is that another discipline discovers it and then serves as an inspiration in its field, a little further away from or distanced from the original field where it appeared. Times change and sometimes we are not fully informed on the latest developments and facilities we have at our disposal. 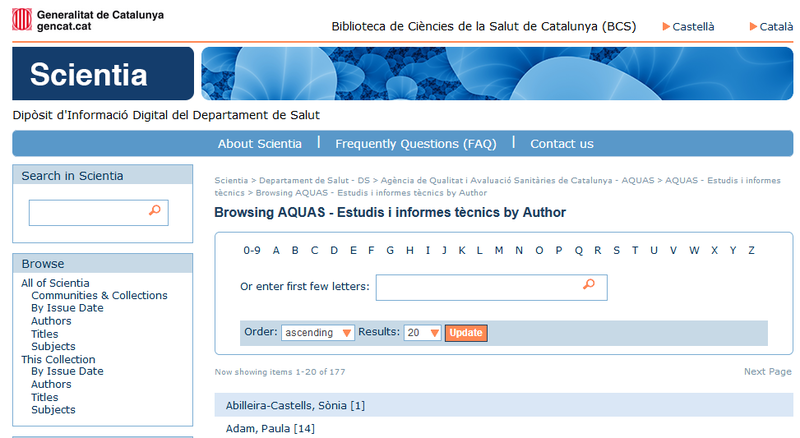 Nowadays, the staff at AQuAS can access the contents of the Library of Health Sciences of Catalonia in a virtual manner which is very good news. The library is a support tool for all researchers and technicians. Having access to available resources from any place is a step forward, leaving behind the model of being tied to an intranet to be able to access all the resources of the library. Knowing that these tools exist and that they can be accessed from any place nowadays can be very useful at a particular time when researchers from AQuAS might need to use them. 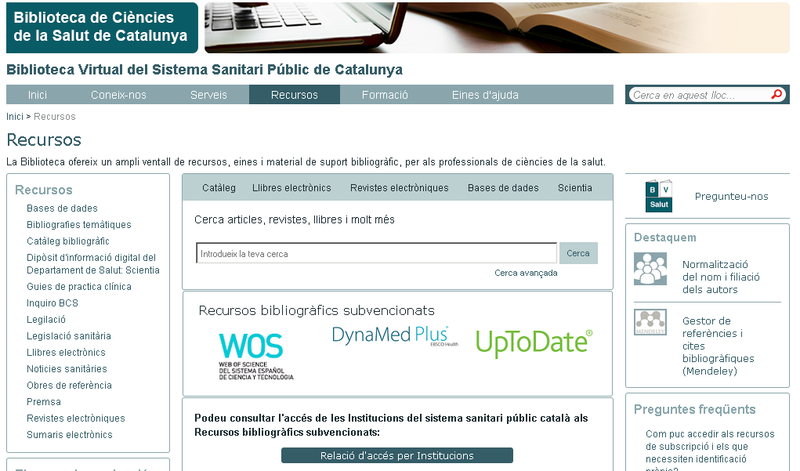 Virtual Library of the Public Health System of Catalonia. 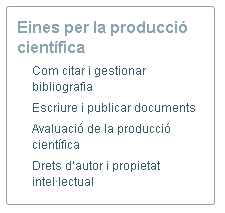 It facilitates the access to the bibliographic services and resources of the Library of Health Sciences of Catalonia. Professionals that work in the general public health sector have access to the bibliographic resources that the Health Department subsidises for the entity they work for. The professionals at AQuAS have the opportunity to register (with a user name provided by the institution) and can thus access all the bibliographic contents that are available from any physical location and device. These available resources include e-magazines, e-books, bibliographic data bases, thematic bibliographies, the catalogue of the bibliographic funds in print of the Library, Scientia (digital information deposit of the Department of Health), collections of clinical practice guidebooks, of health legislation and health news, reference works, the press and electronic summaries. 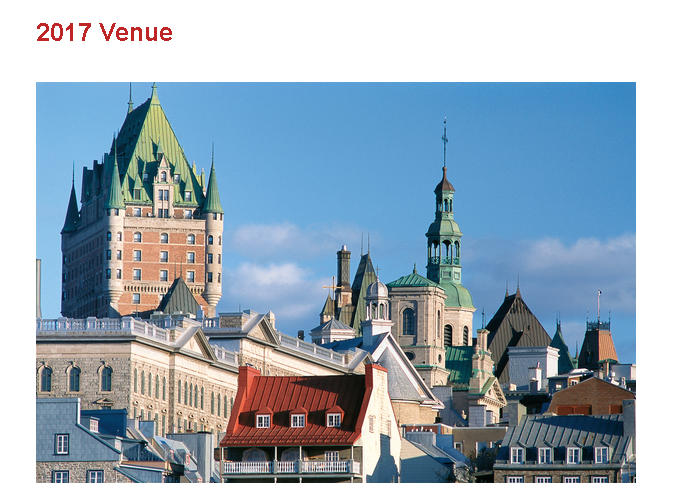 You only need to register. 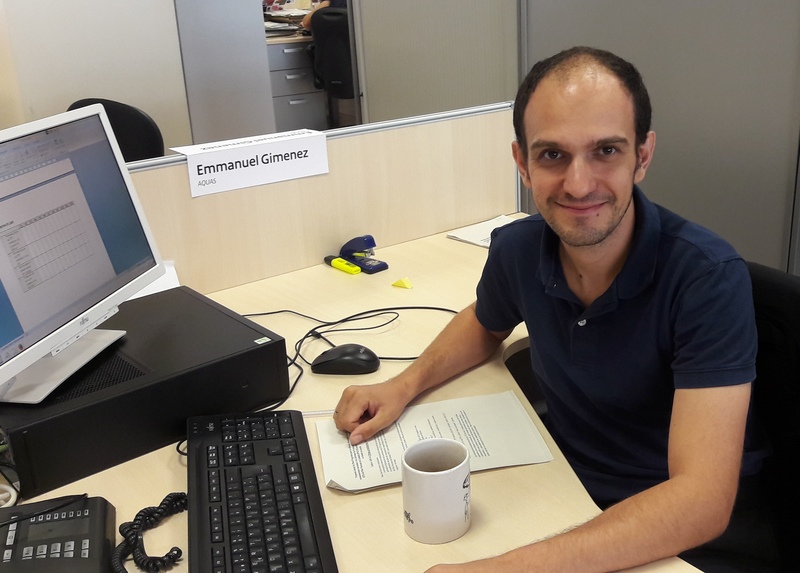 By doing so, professionals at AQuAS can access a systematic review of the Cochrane Library, for example, or an article from the magazine Gaceta Sanitaria, an article from The Lancet or an article from the magazine Health Research Policy and Systems, all from any place. Scientia. It is the institutional repository of the Department of Health. 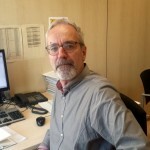 It was created with a view of storing and making the scientific production of the entities of the general public health sector of Catalonia openly accessible with the aim thereby of fostering accessibility, visibility, impact and recognition. Presently, you can find publications from the Health Department, CatSalut and AQuAS, three of the entities which have already signed an agreement of participation. 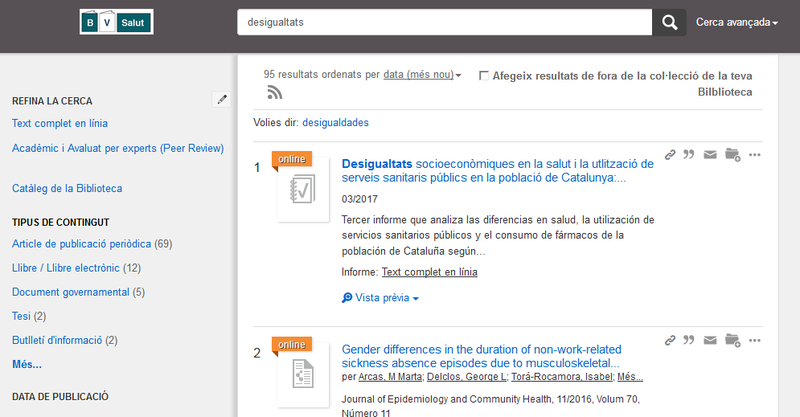 The added value that this repository offers is the search and retrieval of results in three languages (Catalan, Spanish and English), a permanent URL of each publication, a standardised bibliographic citation and the impact index in social networks (Almetrics). The ORCID identification of each author is also included. There are many ways you can stay informed of the latest developments which are published: by syndicating contents (RSS) available in the different sections of Scientia and from Twitter; by means of the hashtag #publicaDSalut or following the account of the library @bibliotecasalut. 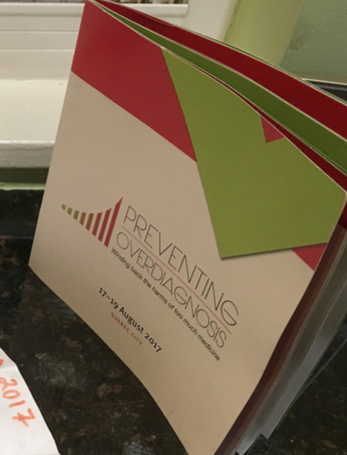 One of the main aims of this tool is the safekeeping of the scientific production generated in the area of health and its effective dissemination. Inquiro. It is what is known as a “discovery tool”, an intelligent tool which searches and explores within the contents of all the bibliographic, digital and printed resources available in the library stemming from a simple question using natural language. The results that are obtained can be filtered by type of document, access (complete text or bibliographic citation), chronological period, subject and resource. The most potent feature is that the results are obtained organised in order of relevance or by date. There is also the option of using an advanced search, and refining the search by fields, using Boolean operators (AND OR NOT). Having a single gateway of access to all the bibliographic resources of the library, being able to explore the content of all these resources at the same time and filtering the contents organised in order of relevance is the major new development. Ask us. This is the user services department and reference of the Library for Health Science of Catalonia. This tool is very practical to make a search and the answer is practically immediate. It is well worth knowing that this service exists! That is all, for today. We are completely sure that all these tools are very useful and that they are the results of a concerted effort by the library to give answers to users, technicians and researchers that carry out research in our field. 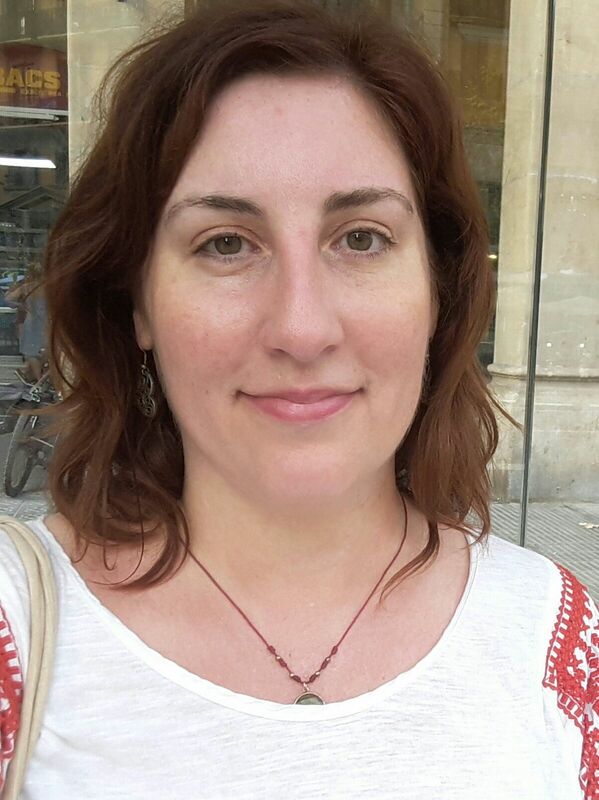 Post written by Marta Millaret (@MartaMillaret) with the collaboration of Toni Parada and Pilar Roqué, head of the Library of Health Sciences of Catalonia (Biblioteca de Ciències de la Salut de Catalunya).